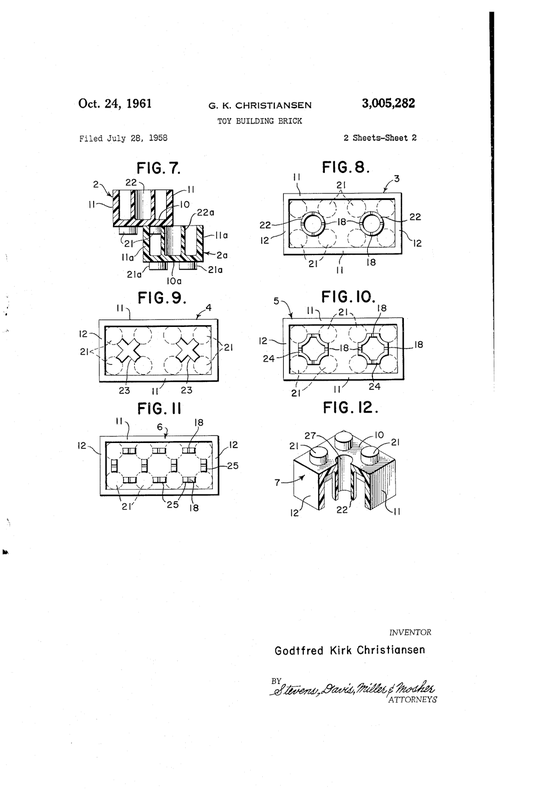 In July 1958, one Mr. Godtfred Kirk Christensen filed a patent at the US Patent office. It was a design for a toy, made of bricks that had "cylindrical projections" on top, and "tubular projections" on the bottom. Both the cylindrical projections and tubular projections could make contact on one or more walls of the brick, and would snap together in a "clamping engagement". There was a priority date of 28 January 1958, as it had been filed first in Denmark. The patent was granted in October 1961. LEGO is today, an empire built on one invention. Today generation after generation knows the LEGO brand. Not surprisingly, it has enjoyed strong sales. In 2013, Bloomberg quoted an analyst as saying, "Bloomberg is on fire. It’s the world’s biggest toymaker in terms of net income, operating income and Ebitda. It had a 71 percent gross margin in its latest results and is posting strong sales growth." Godtfred Kirk Christiansen and his 3 children. The same Bloomberg article placed LEGO as the most valuable toymaker in the world, worth between USD15 billion to USD17 billion. In contrast, LEGO's website in 2012 modestly stated that they were the "world’s third-largest manufacturer of toys". 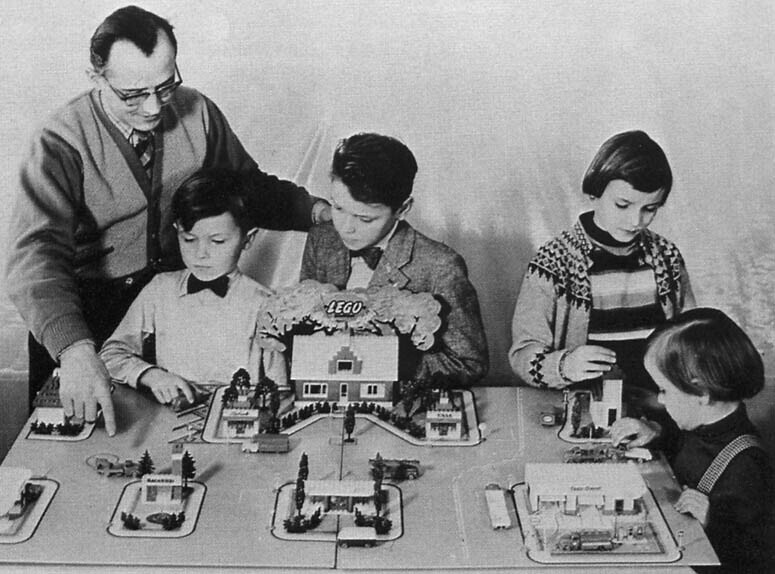 The LEGO Group was founded in 1932 by Ole Kirk Kristiansen. Godtfred Kirk Christiansen was, according to this Wikipedia article, the third son of Ole Kirk Kristiansen. Godtfred's son, Kjeld Kirk Kristiansen, is the richest man in Denmark. The present CEO, Jørgen Vig Knudstorp, joined LEGO in 2001 and became CEO in 2004. (Source: Bloomberg) LEGO had been making losses since 2001 to 2004, due to indiscriminate diversification and intense competition. Under Knudstorp, the company divested its unessential businesses and re-focussed on its core, and became profitable again. Read the original US patent 3005282 at Google Patents. Here are images from the patent. 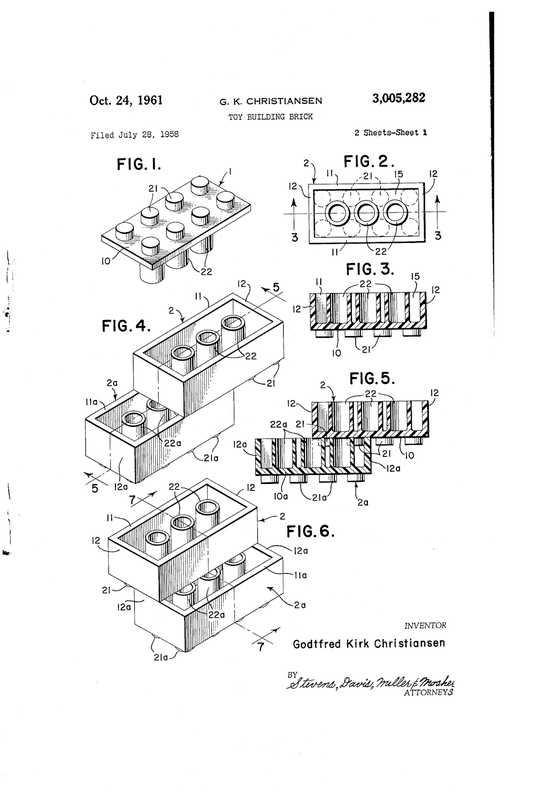 The design of LEGO's play blocks which will be familiar to many readers. In claim 6, there were "cross shaped protuberances". Ref: figure 9 & 10. In claim 7, the "protuberances" were "circular in cross-section". Ref: figure 8.